In the following comments on that thread he took exception to his beliefs being described as “primitive”, and there was some discussion among other commenters about the idea. But that got me to thinking about what we mean when we describe a person, or especially a belief system as “primitive”? I’d like to have a good definition worked out, so the next time I describe something like creationism as a “primitive belief” and I’m challenged on it, I’ll have a good response. In a reverse of the usual anthropological studies, six representatives from a “primitive” tribe in New Guinea visited Britain. They were not impressed with most of what they saw of modern culture, and had no interest in adopting western ways, except for two things. First, they loved the idea of adding feathers to arrows to make them fly straighter, and planned to adopt that innovation immediately. The second thing they decided to adopt? So are we dealing with primitive people here or not? 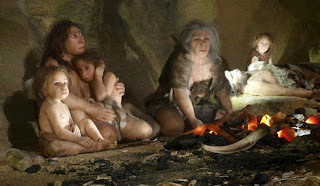 We could restrict the definition of “primitive” people to those who lived a long time ago. But that’s not necessarily a help, since there were decidedly non-primitive philosophers living in Athens at the same time that Judea was full of superstitious goatherders. We could include “uneducated” in our definition, except that I’m sure ancient priests spent years studying their holy texts, and would have considered themselves educated, but I’d still probably describe many of them as “primitive”. So maybe we should see if we can come up with a definition of a “primitive belief system” instead. The fact that a belief is old doesn’t necessarily relegate it to being “primitive”. The beliefs that things fall when you drop them, that tigers are dangerous, and that killing members of your social group is bad are all very old ideas, but we still think they are valid. And I’d want to have a definition that we could apply to tribal superstitions, cargo cults, and long-dead religions, as well as to old institutional beliefs still held by modern people. Belief in some kind of supernatural forces actively working in the world, that substitutes confirmation bias and wishful thinking in place of concrete evidence. Belief that those supernatural forces want specific things from humans. Belief that those supernatural forces can be propitiated by sacrifice or ritual. That’s my first stab at a definition, but I’d like to throw it open to discussion to refine the idea. What would you add or change? ExChristian.Net: What do we mean by a Primitive Belief?